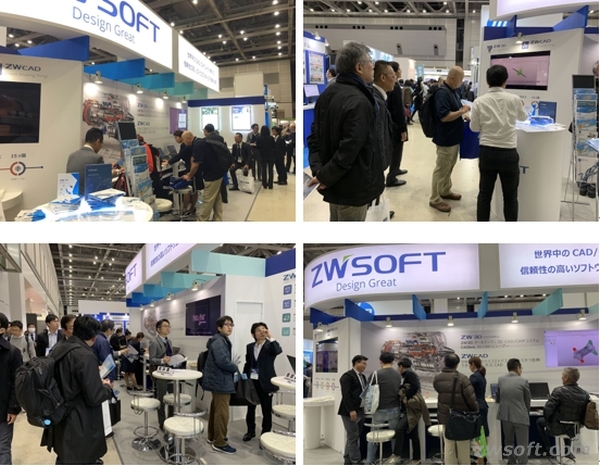 Tokyo, Japan: February 9, 2019 – ZWSOFT has taken part in DMS (Design Engineering & Manufacturing Solutions Expo) in Tokyo, Japan from Feb 6th to 8th with its latest versions of ZWCAD, the efficient 2D CAD; ZW3D, the affordable all-in-one 3D CAD/CAM; and CADbro, and the easy-to-use 3D CAD viewer. As one of the most influential exhibitions in the manufacturing industry, DMS exhibits the leading design technology and solutions to a large amount of worldwide visitors including engineers, designers, product managers and IT managers. During the exhibition, more than 2,000 visitors came to the booth of ZWSOFT, showed great interest in the powerful features of ZWCAD and ZW3D (click to have a try for free), and asked for functions demo and technical guidance. The user-friendly 3D CAD viewer CADbro (click to have a try for free) also received very positive feedback. Most of the visitors were satisfied with the seamless user experience covering 2D design, 3D design and manufacture, and handy viewer. Except for the reliable solutions, the perpetual license and reasonable price provided by ZWSOFT were also appreciated. ZWSOFT thanks all the visitors for your warm welcome! Missed this exhibition? Don’t worry, keep following us for more local activities!